Does patient acquisition (lead generation) or increased brand awareness fall on your list of marketing objectives? Perhaps you have a new product that provides a solution to a common patient problem or you want to educate patients on your services? Maybe you want to align with a national health event like National Diabetes Week or Gynaecological Cancer Awareness Month? Depending on your objectives, educational marketing campaigns are a powerful marketing activity to help you reach your target audience, provide education and increase your brand awareness, leading to the desired outcome of booking a consultation or positioning your brand as a trusted source for information. When we talk about educational marketing campaigns, we are referring to the sequence of consistent messages about your product or service using various marketing channels such as social media, your website, online advertising, search engines, email, print, video, trade shows, and radio. If you think about a patient’s consideration set, along with statistics confirming it usually takes 6-8 touch points before someone engages in a sale, an educational marketing campaign is the best way to keep your brand current and in front of patients during this time. With the right campaign strategy and campaign assets (content, imagery) and an experienced agency to support you, you will be amazed at the results. What does the process look like for a marketing campaign? Position your business as the preferred healthcare provider in your local area. Once the goals are established, it’s time for the creative. The creative refers to the image, professional video, messaging and branding that is used within the campaign. Anything that will capture the attention of your desired audience and make them aware of what it is you do. Step three is usually channel selection. By channels, we mean where we will showcase your campaign whether it’s on your website, social media, advertising, email, presentations, conferences or even in your practice. We’ve visualised the various channels in the infographic below. Finally, we’ve got the ongoing management of your marketing campaign so we can continually edit, improve and ensure you get the results matched to your original campaign goal. Whilst there are lots of moving parts to a campaign, Splice Marketing has managed many successful healthcare marketing campaigns and we are fortunate to a number of happy clients to contest this. So what are the benefits of a marketing campaign? We’ve said it before but we will say it again… a successful marketing campaign requires strategic planning, clever messaging, measurement, and attention. Here at Splice Marketing, we’ve run a multitude of marketing campaigns for the medical and healthcare professionals. We’ve ensured we create clever campaigns that fit the branding of our clients, are within the industry rules and regulations and deliver results. Whether you’re wanting to promote a service, a procedure, a message, generate leads, create interest in your products – we can advise the best formula for your campaign strategy and drive the campaign for you. 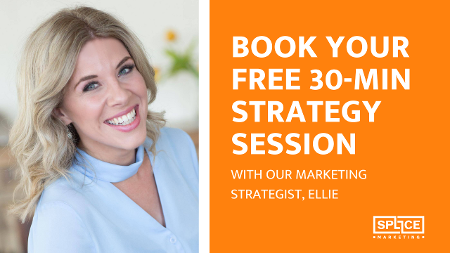 Book in for a free 30-min strategy session and let’s get planning your campaign! What you get when you partner with Splice Marketing for your marketing campaings. Do you want results? Expertise? Industry compliance? We have a proven formula that we have seen work many times over for healthcare professionals and healthcare businesses.